Now that Avatar is officially the highest grossing movie of all time, it's inevitable that studios will continue to push 3D as the new frontier of cinema. But actually filming in 3D is prohibitively expensive. Here's how they fake it. Not many directors share James Cameron's obsession with three dimensional authenticity, and not many films have the budgets to support the directors who do. Filming in 3D requires the use of two cameras, barely offset, capturing all the action in tandem. The technology involved, and the people who know how to use it, come with a high price tag (to the tune of seven figures). 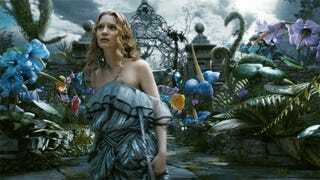 So most of the 3D movies that will be coming out of Hollywood in coming months, including the two new Harry Potter films as well as Tim Burton's Alice in Wonderland, create the effect in post-production. Here's the gist of it: graphic artists separate shots out into layers of depth, which can number anywhere from two layers for shots with simple blocking to eight for shots with more complex compositions. Then, the objects in each layer are carefully traced, creating a topographical map of the scene. Here, the computer steps in, simulating the second camera's perspective by generating another, slightly offset image. The images in the layers closest to the viewer are offset the most, creating the illusion of things popping off the screen, while the background is only offset slightly.